This is one of the dishes that I call "wild card" because it can be eaten as an appetizer, side dish or as a second light, served with diced tomatoes, with a fresh salad or a delicate cheese sauce. The compound can be prepared the day before, kept in the fridge, and stuck it in the oven the next day, or the pudding may also be stored cooked and eaten cold or slightly warmed, keeps its delicate flavor. Personally, I love to taste the pies the next day, I find them more good JL'ho also served with the appetizer, cut into small slices and placed on toast, in short, I recommend you also try and play this wild card as the favorite . 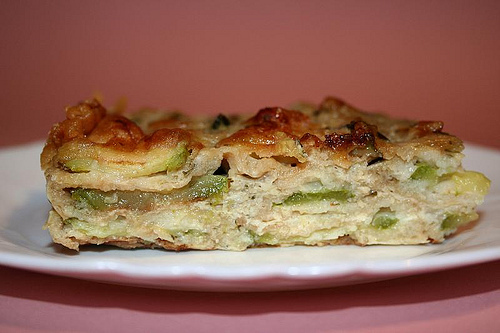 For an average die for plum-cake 600 gr zucchine1 fresh onion slices grande6 pancarrèlatte2 uova4 grattugiatomaggioranaoliosale tablespoons parmesan & pepper Pour into a pan a little 'oil and saute the onion, cut into small pieces, add the zucchini and sauté: must soften slightly, but remain fairly crisp. Add salt, pepper, and after a few minutes, turn off the heat, add a little 'of marjoram leaves and let cool. Soak the slices of bread, without crust, a bit 'of milk. Pour into the mixer zucchini, squeezed bread, Parmesan, eggs, salt & pepper and chop: I prefer that the compound has a consistency not too late, when I eat this pie I like to hear when you bite into a few pieces of zucchini . If you own a mixer with several knives and more speed, it will be easy to set to get a coarse mixture. Coated the mold for plum-cake with a piece of parchment paper, pour the mixture and bake in a water bath in oven at 180 degrees for 1 hour. When the pudding is cooked, remove from oven and let cool in its mold, always in the water bath.